A new version of a bipartisan sentencing reform bill is worse than the original version and will release many dangerous criminals back into American streets, says Sen. Jeff Sessions. “The revised bill still shortens mandatory minimums for repeat drug traffickers, including those who carried a gun, and would allow for early release of those currently in federal prison,” Sessions said in a statement that denounces the bill. “Moreover, this proposal would provide for leniency for illegal alien drug traffickers. The criminal aliens who were responsible for the 2015 killing of Kate Steinle and the 2014 murders of California Detective Michael Davis, Jr. and Deputy Sheriff Danny Oliver had been earlier convicted for the same class of federal drug crimes that some in Congress now seek to roll back through this legislation,” he added. The Sentencing Reform and Corrections Act of 2015 (SRCA) is being pushed by Republican Speaker Paul Ryan in the House. It is backed by some major donors, many Democrats and by President Barack Obama, but is being quietly opposed by many legislators. So far, the bill has not won enough backing for leaders to schedule a debate and vote, as polls showing rising concern about crime and House calendar gets closer to the November elections. The leaders of the opposition include Sessions, Arkansas Sen. Tom Cotton and Georgia Sen. David Perdue. The bill is also opposed by a series of police and law enforcement associations. Even without the bill, the federal prison population has recently dropped, and so have drug prosecutions, Sessions said. Since 2011, the federal prison population has decreased by over 20,000 (over 9 percent), bringing it to its lowest level since 2006. It will continue to decline by another 10,000 over the next year, bringing it to its lowest level since 2004. Drug prosecutions have dropped 21 percent since 2011. The Sentencing Commission recently ordered the release of 46,276 federal drug trafficking felons from federal prison, including those who carried semi-automatic weapons, participated in international heroin smuggling rings, and have violent criminal histories. And just last year, the Obama Administration released 90,000 criminal illegal aliens from custody. 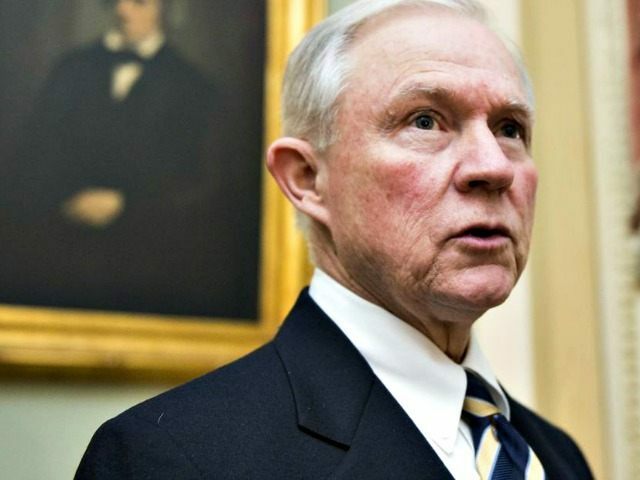 Sessions added that bill softened punishments for illegal aliens trafficking drugs into America — as drug overdose deaths surge to a high never before seen in U.S. history. Over half a million Americans died from drug overdoses in just the last ten years, largely thanks to heroin and other opiates. Overdoses killed 47,055 in 2014 — alone. One hundred and twenty-five people die every single day in America due to drug overdoses, according to the New York Times; 78 of those from heroin and painkillers. Estimates perhaps differ — Sessions said 120 die per day from heroin overdoses. The violence, carnage, and destabilizing mayhem cartels wreak in Mexico and in the U.S. have been extensively chronicled by Breitbart News. A great deal of their revenue comes from smuggling illegal aliens into the U.S. — and 90 percent or more of all heroin trafficked in America is brought here thanks to illegal alien drug mules. Several law enforcement groups have criticized the bill’s sentencing reductions, many retroactive, meant to give relief to convicts, including Third World illegals, pushing drugs onto American communities. “People affected by federal sentencing laws are not ‘low-level non-violent’ offenders,” an incredulous Bob Bushman, President of the National Narcotic Officers’ Associations Coalition, said in an October statement.